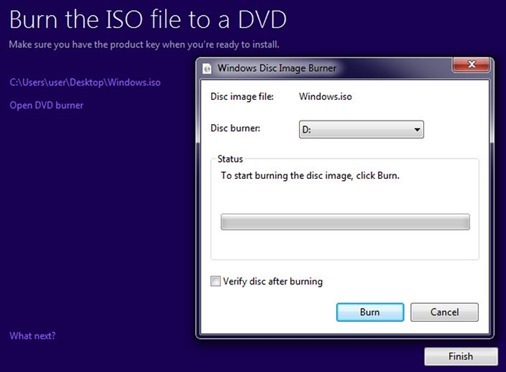 After launch of Windows 10, Many websites are providing un-official links for downloading the ISO file or DVD for Windows 10. Downloading Windows 10 from torrent is also not recommended as the uploader might have infected the installation with Malware, bloatware or Virus. Also if the downloaded version is contained in a zip or rar file, probably the zip archive might be password protected so as to get the downloader to visit some links or surveys to reveal password. Do not waste time on these downloads as it’s now possible to get free version of Windows 10 from Official Microsoft website itself. Update: I have added a new trick on how to download Windows 10 directly (complete setup) without using any additional downloaders. Check bottom of post for update. In this post, I will describe how to download Windows 10 32bit or 64bit from Official Microsoft website. Downloading from Microsoft website is not only safe but also include the latest security updates as well. Before downloading the official version of Windows 10, make sure you meet the minimum hardware requirements given below. 1GB RAM (Memory) for 32 Bit and 2GB for 64 Bit OS. If you meet the minimum requirements for installing Windows 10, follow below steps. We had earlier shared direct links for downloading Windows 10, but those links are not working as of now. So we using the official method for installing Windows 10 using the media creation tool. But you can use the same activation license code/ serial key of Windows 10 for technical preview versions. Download the media creation tool aka Windows installation tool from the links given in the bottom of the page. There are tow versions of the tools, One for 32 bit Operating system and other for 64bit operating system. Download the file based on your current installation whether it’s 32 bit or 64bit. You can check the current operating system installation, go to Start, type Control panel, select System and security, and in System, check at the value for System type. Run the tool, and select Upgrade this PC if you want to upgrade your existing OS. But if you’re planning to install in other PC/ Laptop, select Create installation media for another PC. It allows you to create a Windows 10 Setup Disk on USB drive or DVD and later install in other PC. Remember, to do a clean install, you will require a working license key for Windows 10. Watch this video if you’re doing a clean install of Windows 10. How to Download Windows 10 directly without using media creation tool or any additional downloader. I had already mentioned a trick to get direct ISO link of Windows 10 directly from Microsoft server using Chrome developer tool trick. There is also an additional way to get direct windows10 setup file by following this method. Now using this extension change the user agent of your browser to iPhone. Visit this Microsoft Windows 10 link to directly download the setup file for Windows 10. It’s always safe to download Windows ISO directly from Microsoft servers as it is always reliable & genuine. Instead of searching for Windows 10 Crack or Windows 10 ISO KMS activator in torrents, which can contain spywares or malwares preinstalled or corrupted, I would always recommend to download Windows 10 OS directly from above link.